During the hot summer months, I avoid heating up the kitchen. I cook foods on the grill, assemble simple salads, and enjoy cold treats whenever possible. So I was happy to see the “Tropical Paradise” theme for this month’s Sugar High Friday event hosted by Mary of Alpineberry. Sugar High Friday is the invention of The Domestic Goddess Jennifer Hamilton, and every month foodies around the world make beautiful desserts based on the theme chosen by the host. The host then posts a round-up of all the entries so that all the participants can revel in their peers’ creations. My contribution for this month is a frozen fruit dessert modeled after the yogurt smoothies that I make for my kids; however, I skipped the dairy and just used frozen fruits, coconut milk, and a bit of lime. Because the fruits are frozen when you puree them, the dessert has a nice, thick texture reminiscent of a frozen mousse. There’s no sugar, but really you won’t miss it because the mango, pineapple, and bananas are all sweet and don’t require any extra sugar. No sugar, very little fat, and a high vitamin content makes this dessert truly healthy. You can use fresh fruits and freeze them yourself, or you can purchase frozen mango and pineapple. You will have to freeze a banana, but all you have to do is peel it and wrap it in a freezer bag. Leave it in the freezer just until it’s hard, but not rock solid, then remove and slice. The dessert is great for parties because you just throw everything into the blender and press the button. For a festive presentation, serve it in martini or margarita glasses, and remember to give your guests a spoon. 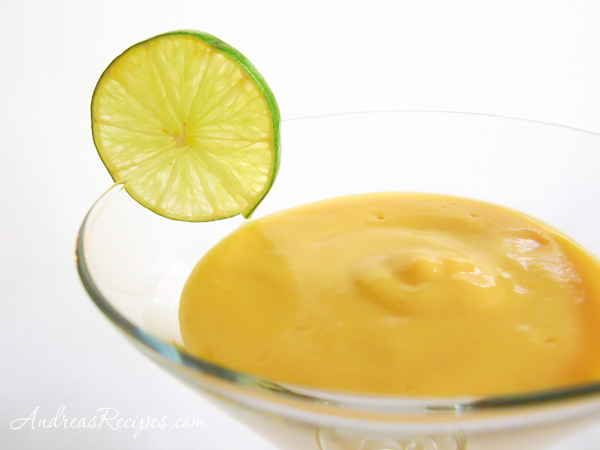 Pour the coconut milk into the blender, and add the mango chunks, pineapple chunks, and sliced banana. Puree until the mixture is thick and the color is even throughout, about 2 to 3 minutes. Add the lime juice and puree for another 15 seconds. Immediately pour into martini glasses and garnish with a slice of lime or pineapple on the rim. I am so sold on anything with Mango! Does the pineapple overpower the mango at all? Either way – I love pineapple, too! Hi Chris! The mango flavor is still very prominent and isn’t overpowered by the pineapple. I like that you created something so creamy without dairy. Sounds like a perfect dessert for a hot summer night. Thanks for participating in SHF! Hum, that looks so delicious and so tropical! Sounds good and healthy to me. No dairy or sugar! Do you have a suggestion as to what can be substituted for the coconut milk? Hi Mary Ellen. You can use light or fat free evaporated milk instead of coconut milk.